Charles Phoenix, left, was born to love kitschy American culture, retro places, and vintage cars. 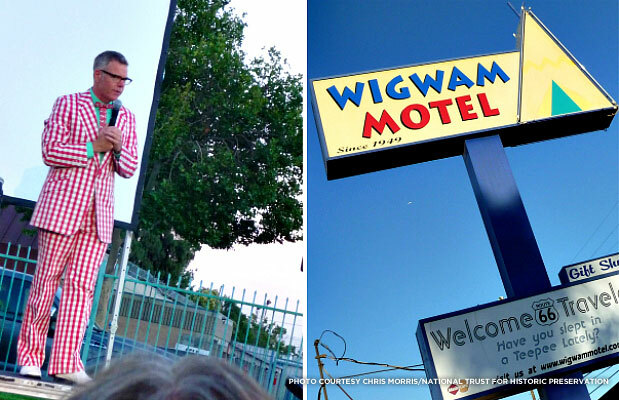 This summer, Phoenix will explore a number of iconic retro places in California, including the Wig Wam Motel in San Bernadino -- where he held a one-night-only event in June to celebrate both the Rt. 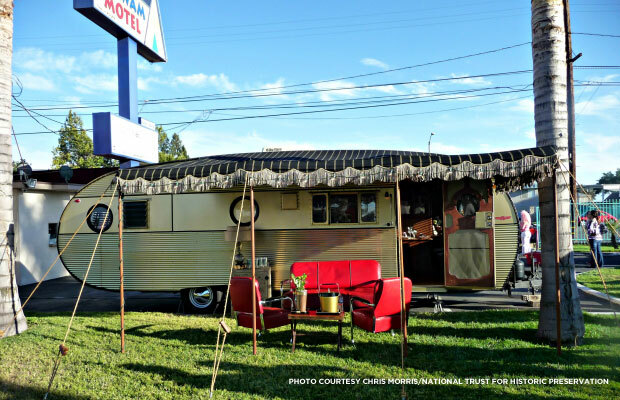 66 landmark’s recent National Register listing and also its dedicated owners/restorers -- and the upcoming Moonlight Rollerway Jubilee in Glendale. We caught up with Phoenix in between all these hopping events to learn what first instilled in him his love for kitsch, what places have inspired him over the years, and why he doesn’t consider himself a preservationist. What first inspired your love of Americana? The gateway drug for me was vintage cars. I was born on a used car lot (my mom and dad were in the used car business). I wanted to know the make, model, and year of every car. 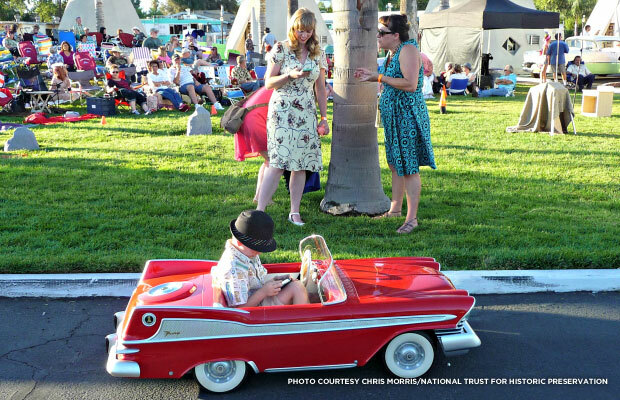 A child, pictured, plays in a toy retro car, echoing the place where Phoenix's love for everything Americana began. At about age 14, I started thrift shopping, which revealed the underbelly of our mass consumerism culture. I already had an eye for style and design, and then I started studying vintage clothes and furniture in the thrift stores too. From there I discovered architecture. I wanted to know what style it was, what year it was built, and who designed it. Growing up in southern California, I had a Disneyland sensibility; I put architecture into themes, and kind of got my kitschy style guide going as a result. Then I started collecting other people’s old Kodachrome slides. That was another way for me to study the midcentury era. I started a performance career based on the slides. They spoke to my sensibilities; strung together, they told a story. What’s your all-time favorite place, and why? The one place that knocks them out of the park is a 1904 amusement park in Denver, Colorado, called Lakeside Amusement Park. It’s lost in its own time warp between the 1920s and '50s. It’s highly stylized with very little new application visible to the eyes. It’s my favorite because it’s so undiscovered. We live in a wonderland world. It’s like one big giant theme park with interesting attractions around every corner. I’ve had the pleasure of visiting so many of them, and you can still find many of the mom-and-pop businesses, landmarks, and icons there. These places are un-self-conscious. There’s no corporate identity. They’re honest, organic, real. That’s what I’m looking for -- the attractions that aren’t famous beyond city limits. I’m a treasure hunter, ultimately, and I’m seeking amazing places and experiences with stories that go along with them. I’m looking for greatness. You’ve described your approach as “disguising history with humor and making it entertaining.” Why humor? What led you to go that route? I’ve been able to show and tell my respect, reverence, and kid-in-a-candy store approach toward the past to the beat of humor. It came naturally to me and grabbed the people. But while I occasionally go up to the border of silly, I always bring it back to reverence and honor. It’s about celebrating our culture. To me, history is the “H-word.” I never say nostalgia, history, memory lane, or those kinds of terms because entertainment is more valuable than history. It’s such an easy sell. It gives the audience an immediate invitation to open up to these stories, and I turn it all into a big retro adventure. I’m not really a preservationist. I’m not a fighter; I’m a lover, so I have to do it a little differently. So when I talk about preservation, I talk about preserving these places for future generations, for people who haven’t even been born yet, so they can experience it too. It’s about honoring our own time on earth, and the time of our parents and grandparents. 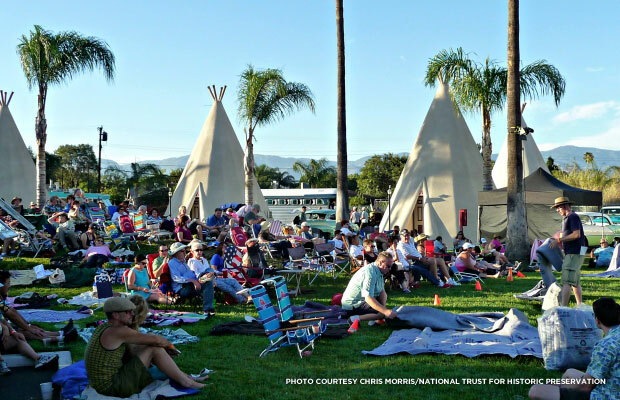 The Wig Wam Pow Wow, which took place June 21, included a vintage car show, a barbecue, and a slide show of vintage travel trailers. Tell me about the Wig Wam Pow Wow event. What sparked the idea for this celebration? I wanted to expand my presentation beyond just me standing on a stage with a screen projecting images. I wanted to create a total immersion environment, so we turned the Wig Wam into a total themed environment for six hours. I’ve never really done this before, but I have a great staff and team. All of this was inspired to pay tribute to Kumar Patel, whose family saved the Wig Wam Hotel, which I consider one of southern California’s greatest treasures. It’s been a landmark since it was built; it just can’t help it because it’s so unusual. The Patels have transformed it into a world-class destination for people interested in American road culture. They saved an icon, and I think people in the future will really appreciate their effort. What would you like visitors to take away from your events? Something like the Wig Wam Motel or Moonlight Rollerway ... this is real, American, pop culture history. This matters. This is part of us and who we are. My sensibility lies in a middle class, mass market, yet mom-and-pop mentality. It all adds up to American pie. I’m trying to feed it to you bite by bite. Learn more about Charles Phoenix and his upcoming events at charlesphoenix.com.